For de læsere, der muligvis undrer sig over at denne anmeldelse er på engelsk, skyldes det, at den oprindeligt blev forfattet til et andet forum. Det skal dog ikke afholde Dem, vor kære læser, i at få Kim Toft Hansens holdning til denne nye, spændende udgivelse– red. Motivated by the rising international popularity of Scandinavian crime fiction, we have seen a weighty increase in scholarly attention towards the genre. For decades, written crime fiction has been a con amore interest for some literary researchers who kept their guilty conscience hidden away on a bookshelf in the basement or in the summer cabin. Now, suddenly it has become comme il fault to spend your scholarly research time ploughing through piles of popular crime fiction deciphering the intriguing plot twist, engaging characters or the excess of violence. Across different media (predominantly books, film and television series), Scandinavian crime fiction has become a type of world literature, an international game changer in television and a growing range of adaptations for a global film audience. Such a world-wide phenomenon deserves scholarly critical attention, because the genre raises a number of important issues among which we find questions of peripherality, popular cultural social critique and, basically, new insight into historical genre developments. The important change within research into crime fiction from Scandinavia and the broader Scandinavian region has been the improved interest from publishing houses to include one or more titles on the matter, rather than having research on Scandinavian crime fiction been done in the regional languages. Alongside the increase in translated Scandinavian crime fiction titles and the broadcast of subtitled Scandinavian content across the globe, it has become considerably uncomplicated to suggest analyses of Scandinavian issues, including especially crime fiction, in journals and book volumes. In this upsurge of research into regional crime fiction from the Scandinavian region, principally Sweden and Swedish authors have effectively caught the attention of both Scandinavian and non-Scandinavian scholars, and for good reason since Swedish authorships have been forerunners for decades. For some reasons, however, we have for years been missing an English title on the pan-regional scope of the genre; a focus on a genre that has had a deep intra-regional generic development besides the obvious international inspiration from especially English and American crime fiction. Now, Jakob Stougaard-Nielsen’s Scandinavian Crime Fiction finally fills this void with a compelling and recognizable take on the genre’s most important developments since the 1960s. At first, Stougaard-Nielsen’s book is recognizable, because he confirms the most tenacious reading of Scandinavian crime fiction; the role of the author couple Maj Sjöwall and Per Wahlöö and their ground-breaking decalogy has become a self-sustaining explanation of the generic content and regional, later international, attention towards crime fiction from the region. For writers, the role of Sjöwall and Wahlöö has been so influential that it has become a common genre trait that crime fiction from Scandinavian countries almost has to be critical towards social issues. For researchers, these traits have been so obvious that crime fiction without this component has been somewhat neglected; Scandinavian crime fiction is much more than societal critique through the lenses of realist fiction. In this sense, Stougaard-Nielsen takes the relationship between Scandinavian crime fiction and the welfare state literally and reads through a well-chosen number of mostly written crime fiction from Sweden, Norway and Denmark. Of course, this point of view is motivated by the importance of social issues in much crime fiction, so for an international audience the book will be a very thorough inspection of important, familiar authorships. Explicitly, Stougaard-Nielsen’s criteria for selecting a corpus of examples are the genre’s global attention; besides Sjöwall and Wahlöö, the centre of attention is, thus, writers such as Gunnar Staalesen, Henning Mankell, Stieg Larsson, Peter Høeg and Kerstin Ekman. From these writers, specific works have been chosen in order to exemplify the focus on debates about the welfare state, but throughout the book Stougaard-Nielsen broadens the perspective to also include a wide range of important authors and television series, such as Jussi Adler-Olsen and The Bridge (2011-). In this way, he both equally covers Scandinavian countries, as equal as it is conceivable with a dominant Swedish scene, at least regarding written crime fiction. Historically and related to debates on welfare, it makes sense to include a chapter on Gunnar Staalesen, but if international attention is the most important criteria, perhaps Jo Nesbø could have deserved a chapter on his own. Staalesen has played a very important role in the context of Scandinavia, but he has never really attracted a Nesbø-like global readership. In a Danish context, the same could perhaps be said about Jussi Adler-Olsen. Though, the fact that Nesbø and Adler-Olsen, for instance, receive less attention than Staalesen and Ekman, stems from Stougaard-Nielsen’s second important focal point: welfare debates in crime fiction. The book is organised historically, and in order to narrate a historical development of the Scandinavian crime novel, Staalesen is a much needed regional link between Sjöwall and Wahlöö and the spread of Swedish crime fiction in the 1990s, mostly by way of Mankell’s popular novels. However, Stougaard-Nielsen’s outline of Scandinavian crime fiction is not only a construction of connections between authorships discussing social parameters of Scandinavian welfare systems; the book is as much an introduction to the composition of the Swedish, Danish and Norwegian societies. These issues are debated to such an extent that Stougaard-Nielsen occasionally seems to think more about Scandinavian societies with crime fiction than the other way around. Long passages of the book include in-depth introductions to and debates about ways in which the societies are organised – and how such organisations in the view of crime fiction seem to be crumbling. Here, methodical reflections on this particular way of relating a wide focus on social engineering as such and fictional handlings of these are missed in the book. In a way, Stougaard-Nielsen seems influenced by British cultural studies, and the correlation between society and fiction is not in itself unsolicited, but it is not without problematic issues. 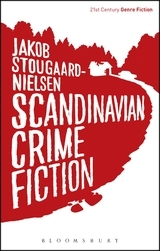 One issue related to this discussion comes from Stougaard-Nielsen’s reference to Scandinavian crime fiction within the context of social realism and authenticity. In reading crime fiction in such a close relationship between society and fiction, realism seems to be the hinge between forms of expression, even though he does not explicitly develop these relations. To some extent, the problem is that much crime fiction, including some of the authors studied by Stougaard-Nielsen, is hardly realistic, let alone social realism. The notion of social realism is, for instance, referenced in his analysis of Stieg Larsson, whom he refers to as ‘a prime example of social realist Scandinavian crime fiction’ (101). Stieg Larsson does indeed include debates on social issues, but that does not in itself make the stories social realist. For Stougaard-Nielsen, there seems to be no issues in claiming a novel social realist, on the one hand, and referring to it later as an ‘updated folk-tale motif’ imbedded with ‘intertextual references’ construing it as a ‘postmodern parody’ (106). A similar thing could be said about Staalesen’s private detective which is a peculiar figure in a Scandinavian context; yes, the detective character, formerly a social worker, is the author’s prime incentive to include social debates, but Staalesen continually includes metafictional references to the Norwegian private detective as a fictional construct. Basically, if society is rooted deeply within Scandinavian crime fiction, there is of course a very important sociological difference between low real crime rates and, apparently very high crime rates and a surprising large number of cunning serial killers in Scandinavian crime fiction. As rightly pointed out by Stougaard-Nielsen, what seems to be the case is that crime fiction uses authenticity effects, such as hyperlocations, but understanding the genre as particularly social realist is taking the social issues a tad too far. Rightly, Stougaard-Nielsen points out that Sjöwall and Wahlöö ‘owes as much to genre conventions as to perceived contemporary social conditions’ (43); so he does seem to have some hesitance towards the realist claim too. However, it is not the first time this reading of Scandinavian crime fiction is put forward, and it seems to be a self-confirming thesis that it is so. It is so easy to be led astray by using real places, real social problems and sometimes real cases as the basis underneath improbable plots. Even if the social realist claim is debatable, Stougaard-Nielsen pushes the arguments about place in a very interesting and important direction. His reading of places, landscapes and memory, to some extent presented previously in Stougaard-Nielsen’s work on crime fiction, is a highly original and very convincing expansion of the vocabulary from which to describe and analyse crime fiction, not only from Scandinavia but also in general. For him, landscape and nostalgia comes together in a way that makes it possible to discuss welfare societies through crime fiction in a very forceful way. Nostalgia is, for Stougaard-Nielsen, directly tied to place and Scandinavia’s position in the peripheries of the world, of Europe, and bound deeply to the spatial metaphor included in the Swedish nation as a ‘people’s home.’ The cracking of the welfare state is also conjoined with a spatial upheaval in a less grounded and connected state. On the one hand, the deeply imbued nostalgia for a society (that perhaps has never been) is tied to the above discussion of realism; a nostalgic longing for a past utopia may not seem as implicitly realist as it may be viewed at first. On the other hand, nostalgia needs something as a point of departure, and here shared anxieties in present society may be a very important collective basis from which to build a social-critical crime narrative. In a sense, Stougaard-Nielsen is right on the brink of suggesting that Scandinavian crime fiction proposes what could be termed nostalgic dystopia: if the social issues that are raised in crime fiction and the remembrance of better times are not taken literally and seriously, we may end up with a crime-ridden world like the ones depicted in Scandinavian crime fiction. Stougaard-Nielsen’s work on welfare nostalgia is the most important contribution of the book. Altogether, Stougaard-Nielsen’s theoretical association between authenticity, realism, places and landscapes, nostalgia, and expressly welfare debates takes the genre’s own widespread interest in social issues, an interest reflecting in much scholarly work on Scandinavian crime fiction, and fuses this with a decidedly original nostalgia approach to the genre. These are the recognisable and the compelling ideas implanted in this much awaiting volume on primarily written crime fiction. Of course, titles such as The Killing (2007-12) and The Bridge (2011-) must be mentioned in a book on an internationally profiled subgenre; though for Stougaard-Nielsen the genre is mainly read for its literary merits, which means that the references to other media may seem oddly like fish out of water, analysing more content than form. However, this is only a minor issue. Related to the genre as a cross-media phenomenon Stougaard-Nielsen briefly touches upon the notion of Nordic Noir, but regrettably he never really confronts the concept. This is indeed a pity, since Jakob Stougaard-Nielsen himself and the blog and book club at UCL (where he spends his daily scholarly routines too) may be the breeding ground of this now wide-spread concept that everybody seems to be talking about.